In this insightful exploration of how imagination affects health, Linda Hall explains how your thinking can either damage or improve your physical health. Where you go in your head, you go in your body. Your body doesn't know the difference between imagining something and it actually happening; it produces the same physiological responses, i.e. stress or relaxation in the nervous system and the release of hormones and chemicals which you experience as feelings and emotions. What happens in your head affects your nervous and endocrine systems, digestion, heart rate, breathing, sleep and even your immune function. It's likely you enjoy the relaxing benefits of drifting into a nice daydream every now and then, but are you aware of just how often you use your imagination in a negative way and the daily impact this has on your health and well-being? Used negatively, your imagination can limit your potential for a full, healthy and happy life. As humans, we are all creatures of habit and tend to normalize negative thinking patterns, along with the disaster movies we create in our heads when we are anxious about something. The trouble is, what we habitually think and envisage is what we come to expect. Every experience we have is hardwired into our body through a network of neural pathways and cellular memory; in a very real way we train our systems where to go. We get good at 'doing stress' in this way and just like anything else it becomes a habit. Yet we all have something wonderful called neuroplasticity, which is the ability to produce an almost infinite amount of neural pathways. This means that we can develop new useful habits to replace the old, less helpful ones. Positive use of the imagination to envisage desired states of health and well-being has long been practiced in complementary healthcare and is now recognised by orthodox medicine as a powerful self-help tool for a wide range of conditions: from healing cancer, to developing self-esteem and inner confidence. Olympic sportsmen and women have used it for decades in their training. 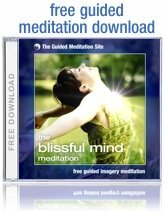 Meditation also has a rich tradition of using positive imaging through guided visualisation or 'creative visualisation' as it is sometimes known. It's like being told a pleasant story which opens the door to positive experiences that your body will remember. The beauty of it is that the whole of you gets involved in a gentle learning process: body, mind and spirit. So the next time you say that something is "all in the mind", think again, it's likely to be in your body as well! Linda Hall is a talented and experienced meditation teacher and a valued member of The Guided Meditation Site. Please follow this link to explore Linda Hall's guided meditations. Article by Linda Hall from www.The-Guided-Meditation-Site.com.